View More In Mountain Bikes. Tackle the terrain, take on the turf, let no path go by without grabbing it by the roots and rocks and climbing aboard. The 24" boy's Mongoose Cammock is begging you to take it for a spin, grab some dirt by the horns and really rip it up. 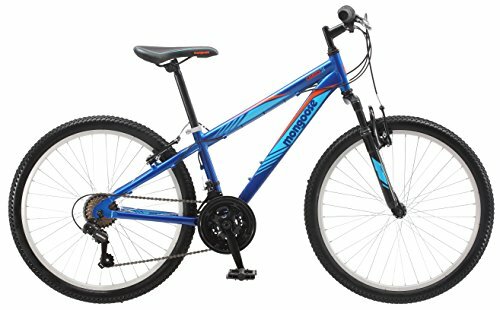 Complete with an alloy mountain-style frame, a powerful front suspension fork, and 21-speed twist Shifters to help you climb anything in your path. It has 1.95" wide knobby mountain tires with light and strong alloy rims for added durability. Reliable dual v-brakes and a strong 3-piece steel crank round out this trail-ready thrasher. What are you waiting forget out there and conquer the trail on your new 24" Mongoose Cammock. There's nothing you can't do on a Mongoose. If you have any questions about this product by Mongoose, contact us by completing and submitting the form below. If you are looking for a specif part number, please include it with your message.